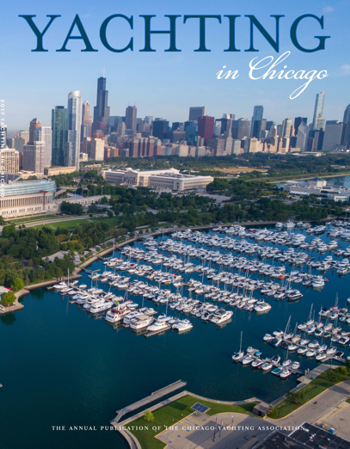 The members of the Chicago Yachting Association have many people to thank for making these publications possible. First, there are the advertisers that support the Chicago yachting community. Our readers are urged to patronize them and support them as they support us with advertising and other content. Those who contributed articles, photos, data and background information are also deserving of thanks. Everyone's cooperation and help is greatly appreciated. The Chicago Yachting Association produces Venetian Night, speaks with one voice for the Chicago yachting community, hosts our annual get together at the Yachting Celebration to award our victories, and publishes this wonderful magazine of record - YACHTING IN CHICAGO that celebrates our boating accomplishments. The Association is part of so much more as you will see as you browse through our online library of Yachting In Chicago publications. Enjoy! VENETIAN NIGHT Held at Navy Pier in cooperation with Chicago Yachting Association. HISTORY OF CYA Early in 1998, the officers of the Chicago Yachting Association recognized the need for one organization whose mission would be to foster greater coordination between the public and private sectors regarding marine activities in the Greater Chicagoland Area.